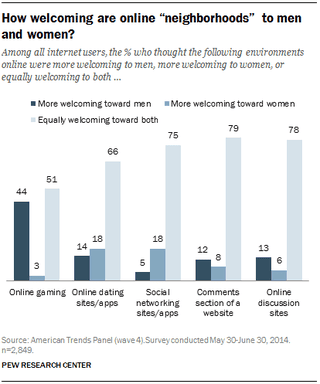 I came across the fantastic Pew study on online harassment yesterday (sometimes I really love my job). Please note the responses re: online gaming. Sadly, the report does not contain an in-depth gender split of replies but I found it very telling that this section is so divisive in its responses.. The ignorance and/or cognitive dissonance is strong in these 51 percent, for sure. The most targeted group of internet users? Women aged 18-24. I am Jack's complete lack of surprise..